Designed and manufactured in upstate NY the MX-9900ss skid steer mounted wood chipper is designed after our proven flagship design, the PTO driven MX-9900. The Made in the USA WoodMaxx MX-9900ss skid steer wood chipper is the most robust skid steer wood chipper in its class. Please read the feature descriptions below for more information. - Proudly Made in the USA!!! - Hydrostatic infeed system requires only 2 quarts of oil!!! The WoodMaxx MX-9900ss auto-feed chipper is a robust self-feeding skid steer mounted wood chipper. This wood chipper is extremely compact, and built to withstand commercial use. The MX-9900ss utilizes a patent pending hybrid hydrostatic drive infeed system, instead of using the hydraulic oil form the skid steer to drive the in-feed roller. This system allows for a more powerful efficient chipper that does not generate excess heat that competing chippers do. 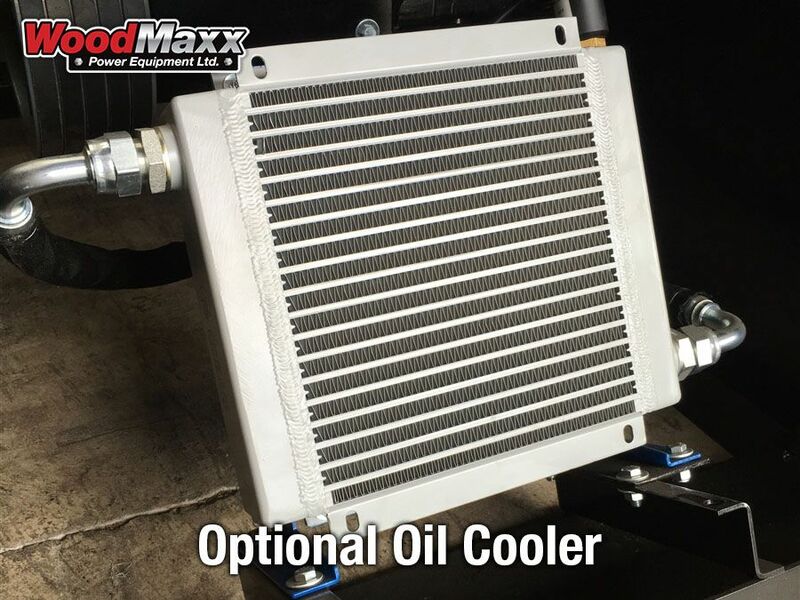 Since all skid steers have different oil flow and cooling abilities, an optional oil cooler is also available. High torque White (USA) brand hydraulic motors power the MX-9900ss. 4-High quality (A8 tool steel) made in the USA knives are standard equipment on all MX-series wood chippers. The design of the WoodMaxx MX-series wood chippers is so unique and innovative that it is now patent pending. WoodMaxx MX-9900ss wood chipper comes shipped to you in in a wooden crate and is 100% completely assembled. Simply attach the MX-9900ss wood chipper to your skid steer, lower the infeed bin, raise the discharge chute, and fill the hydrostatic oil reservoir with two quarts of 10W-40 motor oil. The WoodMaxx MX-9900ss wood chipper is manufactured and assembled right here at our facility, assembled by American workers, and given a comprehensive 22 point inspection, and is serviced prior to leaving our warehouse. Simply follow the user friendly operator manual and you will be chipping in no time at all. The WoodMaxx MX-9900ss wood chipper uses a 26.5" x 1" dynamically balanced 220 pound flywheel that spins at 1200 RPM to deliver the energy to quickly and easily chip all types of material. Competitors use a wide range of flywheel weights, much lighter in most cases. Through thorough testing and experimentation, WoodMaxx has discovered that the 220 pound 26.5" flywheel/ 1200 RPM speed is ideal for wood chippers. Speeds in excess of 1200 RPM will simply wear the knives prematurely, and the result is often saw dust instead of wood chips. All WoodMaxx MX-series wood chippers are equipped with four made in USA chipper knives and made in USA Holo-Krome class 12.9 knife bolts. Designed for extreme duty - there is no better material that can be used for superior performance and life than our through hardened, heat treated, high chromium, high carbon, A-8 tool steel knives. The WoodMaxx MX-9900 wood chippers come standard with four offset reversible dual edge knives installed. That's right, four knives! And they are offset so that with every 90 degrees of rotation, the knife is taking a slightly different cut of the material. This is equivalent to using a serrated knife to cut bread instead of a straight knife. Ultimately, this feature allows for chipping large material without overworking your tractor. The reversible knives mean that you get twice the work out of one set of knives! These knives are securely bolted into a pocket that is milled in the flywheel using American made Holo-Krome bolts for added security. This design utilizes a new flywheel pocket design developed by WoodMaxx. This eliminates knife and bolt breakage that can be found on other dual edge knife systems. Our chipper knives are made right here in upstate New York of hardened, high carbon A-8 tool steel. The WoodMaxx MX-9900ss skid steer chipper attachment is equipped with a universal skid steer mounting bracket that will fit any skid steer that utilizes a corresponding mount. Since all hydraulic systems require protection from pressure spikes, the WoodMaxx MX-9900ss skid steer chipper attachment is equipped with a built in relief valve to prevent damage to the drive motor. Patent pending design: The WoodMaxx MX-9900ss skid steer mounted wood chipper is complete with a self-contained hydrostatic pump that requires only a two quart oil reservoir tank to power the infeed motor. Unlike a standard hydraulic system, a hydrostatic drive system is so powerful that it is the same type of drives system that is used to drive bulldozers, trains, excavators, skid steers, and even ride on lawn mowers. These hydrostatic systems use standard 10W-40 motor oil, spin on oil filter, and are so efficient, generate so little heat, that they require only a fraction of the reserve oil as a standard hydraulic drive system. This type of system also allows for complete speed control from 1 RPM to a full 75 ft./min. with full power through the speed range. 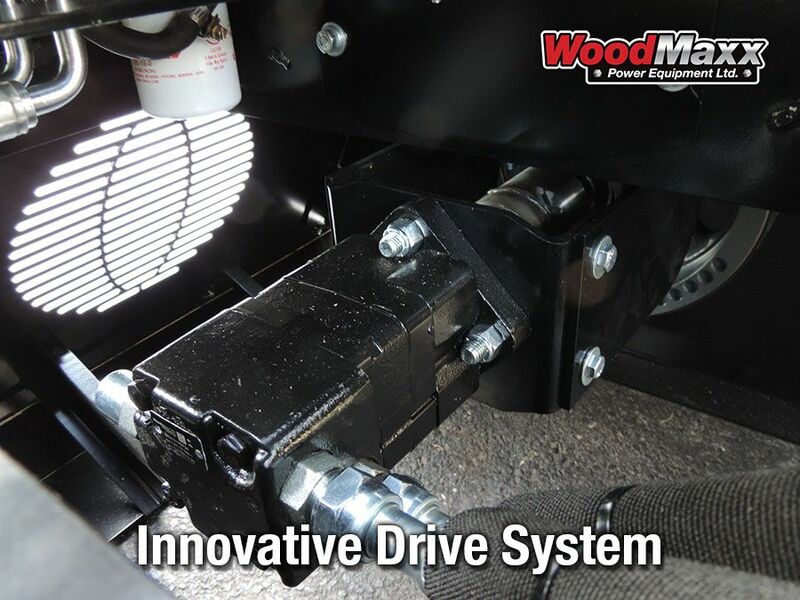 The Hydrostatic drive system on the WoodMaxx MX-9900ss is so unique to the industry that it is now Patent Pending. Hydraulic oil is not required from your skid steer to drive the infeed motor. The advantage of this hybrid system is that all of the oil from the skid steer is directed to the main drive motor with no elbows, diverters or valves which reduce efficiency and generate excess heat. The hydraulic motor is a powerful White brand standard size SAE 4 hole "A" mount. What does this mean to you? Down the road if there is a need to replace the motor, it can be found just about anywhere. Because all skid steers utilize varying amounts of oil reserve, and have variable cooling capacities we have an optional oil cooler available. This cooler is 12 volt with a built in thermostat that is set at 140 degrees fahrenheit. This feature is not found on any competing skid steer mounted wood chipper, and an important available option to protect your skid steer from over heating. WoodMaxx MX-Series wood chippers are equipped with USA "White drive products" brand hydraulic infeed motors. 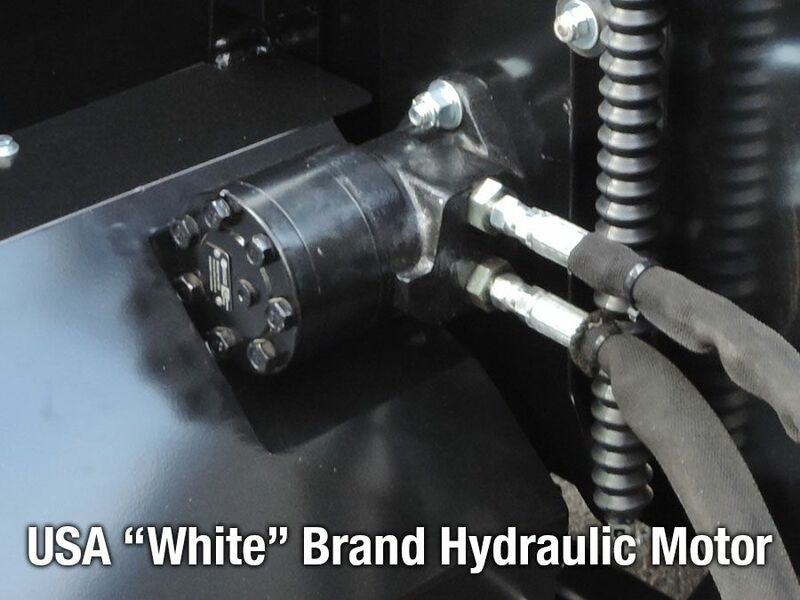 White is renowned for their high quality American engineered hydraulic motors. 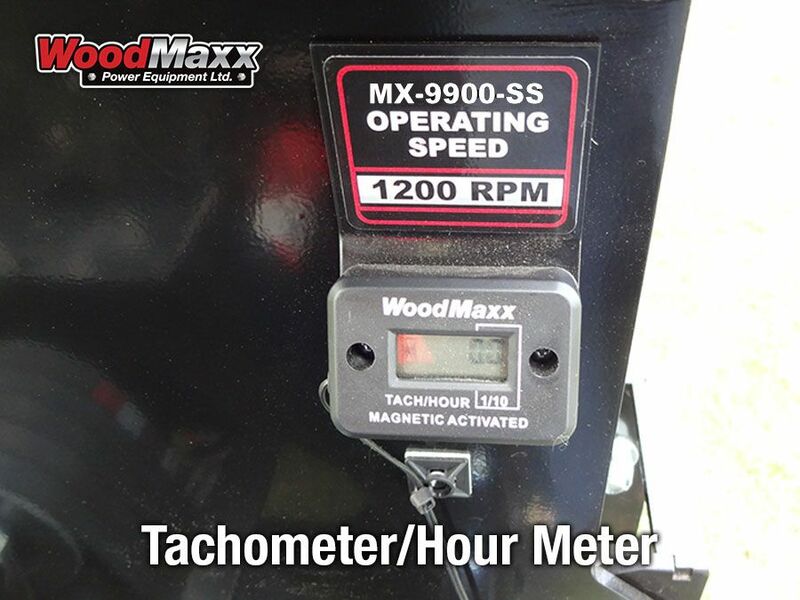 The WoodMaxx MX-9900SS Skid steer Wood chipper attachment is equipped with a built in electronic tachometer/ hour meter. Since all skid steers put out varying oil flow, it is difficult to determine if the proper flywheel speed is achieved, so we have added a digital tachometer. Simply engage the oil flow from your skid steer to the chipper at idle and throttle up until the meter reads 1200. This feature ensures that you run the chipper at the optimal speed without guessing. Additionally, the hour meter takes the guess work out of maintenance intervals. 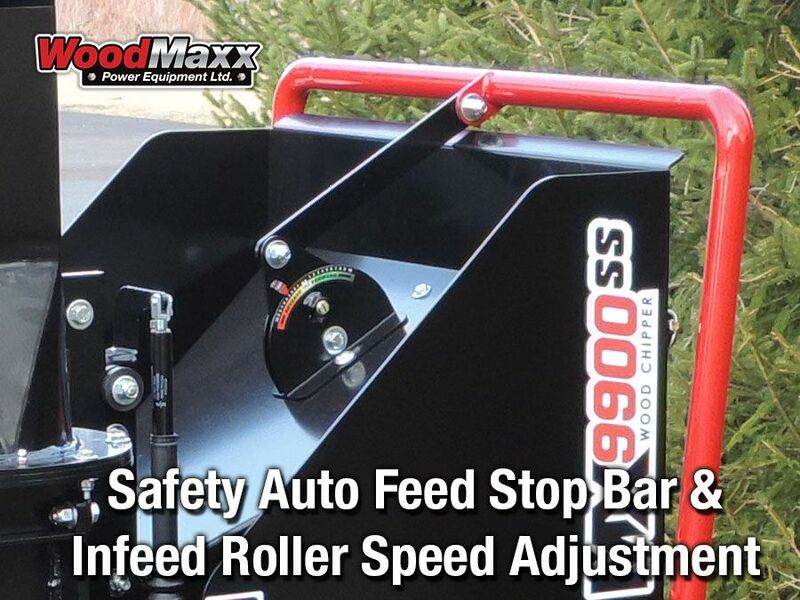 The WoodMaxx MX-9900ss skid steer chipper attachment is equipped with a fold up infeed bin. This feature allows the user to simply fold the infeed bin upward for storage or transport. WoodMaxx MX-9900ss wood chipper offer a larger 9"x 9" infeed opening to easily accept those crooked branches. This is the largest infeed opening available on any skid steer wood chipper in its class. 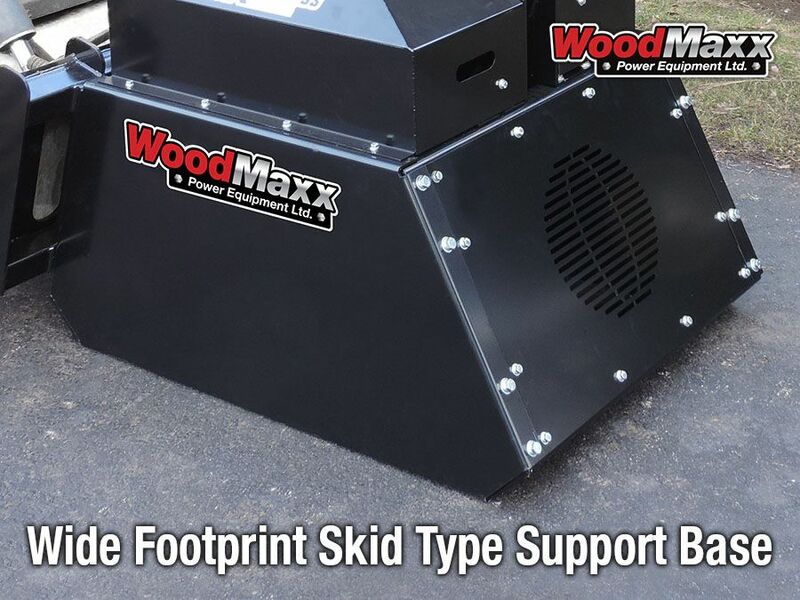 WoodMaxx MX-9900ss wood chipper is manufactured using heavy gauge 3/8" thick (American Standard A-36) structural steel plate for the flywheel housing. Since the flange bearings are mounted on the flywheel housing, this gives added strength and rigidity. Other chippers use only 1/4" steel. WoodMaxx MX-series wood chipper knives can be changed easily by one person in as little as 10 minutes. The entire top of the blower housing opens up like a clam shell. This allows for easy access to the flywheel and knife changing. Other chippers require you to reach into the infeed bin to hold the head of the bolt, while someone else turns the nut from the backside of the flywheel. WoodMaxx MX-series skid steer wood chippers use a high torque hydraulic motor that requires 18-24 GPM, but we do offer a slightly smaller motor for skid steers with as little as 15 GMP as an option. (Please call). Additionally, the torque from the motor is transferred through two sheaves to power the flywheel. This system increase the flywheel speed and allows the belts to absorb shock from the chipper head to reduce stress on the drive motor. This chipper comes standard with 5 extreme duty 5/8" wide cogged drive v-belts that are made specifically for WoodMaxx . Cogged v-belts run cooler, and transfer more torque than plain smooth v-belts. Although the OEM belts are very high quality, if the need arises, the standard size BX belts allows you to purchase replacement v-belts at any auto parts store. Safety is paramount on WoodMaxx wood chippers. Located on the top of the infeed bin, the MX-9900ss utilizes an easy to activate hydrostatic auto-feed stop safety bar to disengage the infeed roller in case of an emergency, or to clear the infeed bin if necessary. Simply pull the bar forward to increase the speed, and push if forward to decrease or reverse the infeed speed and direction. 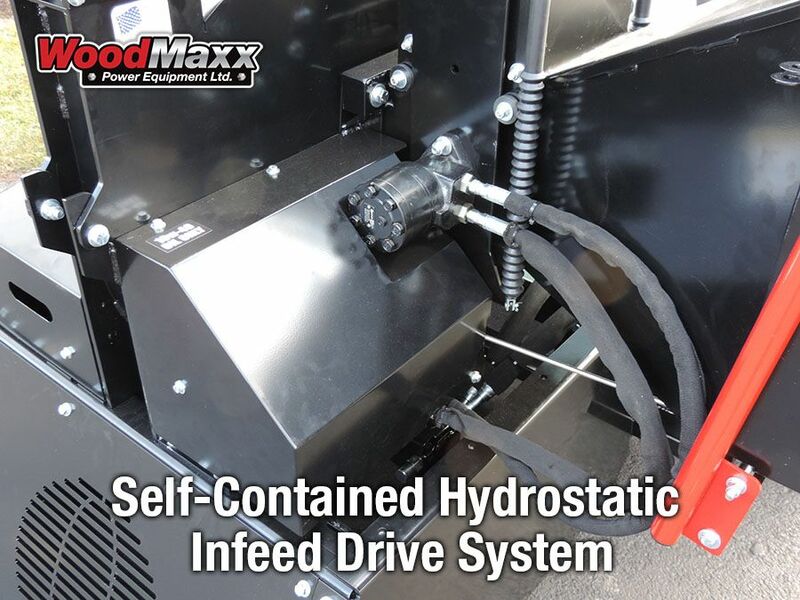 The hydrostatic drive system is so refined that the in-feed speed is fully adjustable from 0-75 ft./min. with power in the full range. All Wood chippers will require some routine maintenance, like adjusting the gap between the bed knife and the flywheel knives as they wear. This gap is essential to proper operation of the wood chipper. 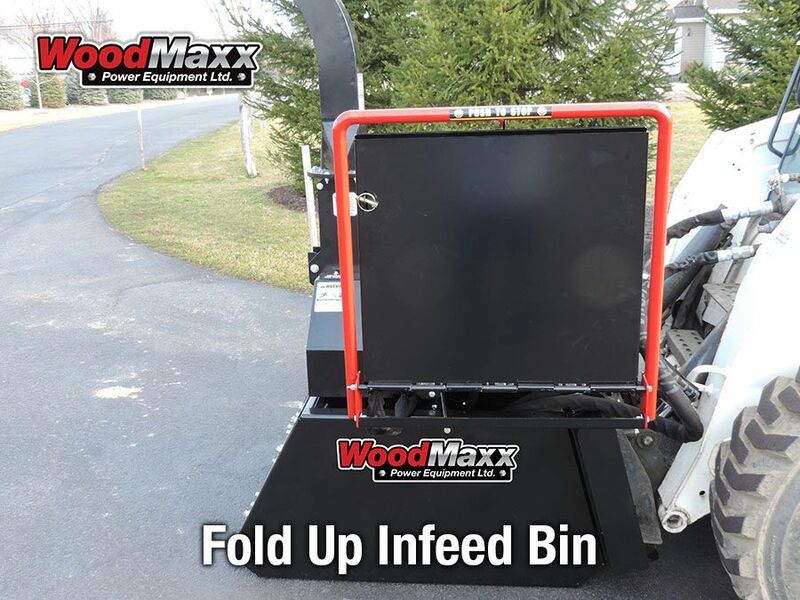 The infeed hopper on the WoodMaxx MX-9900 swings open to expose the bed knife. This feature allows the user to access the bed knife (anvil) by opening the hopper to expose the knives. Simply remove two bolts and the hopper will swing open like a door. This feature is exclusive to WoodMaxx, other chippers require the user to crawl into the in-feed hopper to change the bed knife or adjust the gap between the bed knife and the flywheel knives. Because of its robust weight of the MX-9900ss wood chipper, and to prevent the machine from sinking into the soft ground during operation, the new MX-9900ss offers a wide footprint skid type support base. This skid shoe type base is angled upward on the end like a ski to prevent it from digging into the soft ground use. WoodMaxx MX-9900ss wood chippers are the perfect combination of size, weight, and features. Compact enough to easily move around, yet strong enough to get the tough jobs done. MX-series chippers are loaded with features typically found on much larger commercial machines that are much more expensive. The strength of our machines starts with using heavy formed (American standard A-36) structural steel plate, the strongest plate steel available. Each piece is laser cut, on a 2 million dollar laser and meticulously welded by highly skilled American welders. WoodMaxx MX-series chipper exclusive structural design includes a 2" diameter main shaft that passes through the flywheel housing and is supported by 2 flange bearings. This feature, combined with the 2" shaft, allows the flywheel to run true and ads a great deal of strength. This design sets WoodMaxx chippers far apart from the competition, and it is a design feature you should not overlook when shopping for a chipper. WoodMaxx MX-9900ss wood chippers are extremely robust, and can handle very heavy use. Designed and manufactured in upstate New York, each machine we offer is thoroughly tested on our 18 acre proving grounds before being offered to the public. With years of experience and thousands of machines in service today, we are confident that this machine can handle even the toughest projects that you have. Our machines are currently in service in several commercial applications, such as: the Army Corps of Engineers, college campuses, municipalities, tree farms, golf courses, apartment complexes, and thousands of residences. WoodMaxx chippers are also represented around the globe, with machines as far away as Hawaii, and Alaska, as well as several countries including: Chile, Russia, Panama, Colombia, Poland, United Arab Emirates, Israel, west Africa, Greece, Norway, Iceland, Ecuador, Honduras, Ireland and of course Canada. A WoodMaxx exclusive and patent pending design. Everyone knows what happens to the branches when they reach the flywheel knives of the wood chipper, but getting the material pulled into the wood chipper knives effectively and quickly is the trick. Many factors must be considered when designing an effective infeed roller system: the overall diameter, knife spacing, tooth angle, type of steel, hardness, down pressure and infeed speed. 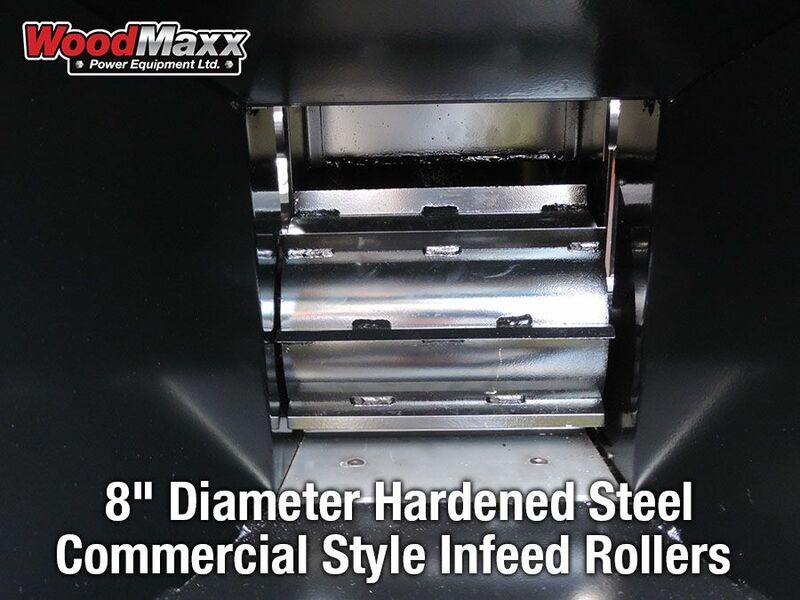 After countless hours of research and development on the infeed system, for the MX-9900ss we have developed a large diameter (8") infeed roller. WoodMaxx MX-series auto-feed wood chippers utilize exclusively designed high carbon steel chisel tooth infeed rollers. This exclusive design allows the chisel shaped teeth of the roller to grab and climb up and over the branches to easily bite in and effectively pull the material into the wood chipper flywheel at speeds up to 75 ft. /min. In short, the larger the roller, the easier it rolls over the material. The smaller the roller, the more likely it is to slip and spin on the branches. Similar to how the small wheels of a shopping cart stop when contacting a small stone in a parking lot. WoodMaxx MX-series auto-feed wood chippers utilize high carbon steel chisel tooth in-feed rollers. In order to prevent material like tree bark and leaves from impacting between the teeth of the infeed roller, we spaced the chisel teeth out. This spacing allows the complete down pressure of the high tension gas springs to be focused on one chisel tooth at a time increasing total down pressure. Additionally this spacing allows the roller to self-clean. These rollers, along with the high tension gas springs aggressively bite into any type of material. After welding, these rollers are hardened to ensure that the teeth stay sharp for many years to come. The advantage of this type of roller is that is aggressively grabs any size limb with or without leaves up to 9". Long or short needle pine, as well as small, vine type material is no problem for the WoodMaxx MX-9900ss wood chipper. Small branches, leaves, or vines won't wrap around the infeed roller as they would on other wood chippers. The exclusive advanced design of our in-feed rollers is a feature that should not be overlooked when shopping for a wood chipper. Our infeed roller designs are so unique and effective that they are now patent pending. The WoodMaxx MX-9900 PTO wood chipper is equipped with a 360 degree swivel discharge chute. 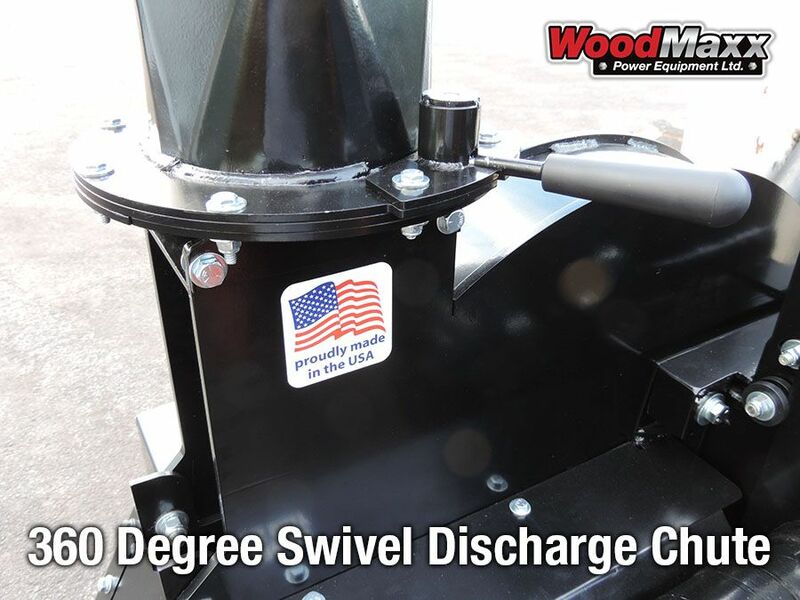 With easy two finger operation, we have incorporated a convenient handle that effortlessly allows you to swivel the discharge chute 360 degrees so that you can direct the chips into a trailer or the back of a pickup truck without having to move the entire machine. Simply push down on the handle and swing the chute, when you release the handle a spring loaded pin will drop down to lock the chute into position. No tools required. The hydrostatic pump belt tensioner is automatic on the MX-9900ss wood chipper. This feature keeps consistent and correct pressure on the drive belt. If the drive belt is too tight then excessive bearing and or pump failure is likely, too loose and the belt will slip. This feature eliminates the need to adjust the belt, ensures that proper tension is achieved, and increases the longevity of the pump and bearings. It also saves you the hassle of constant adjustment. 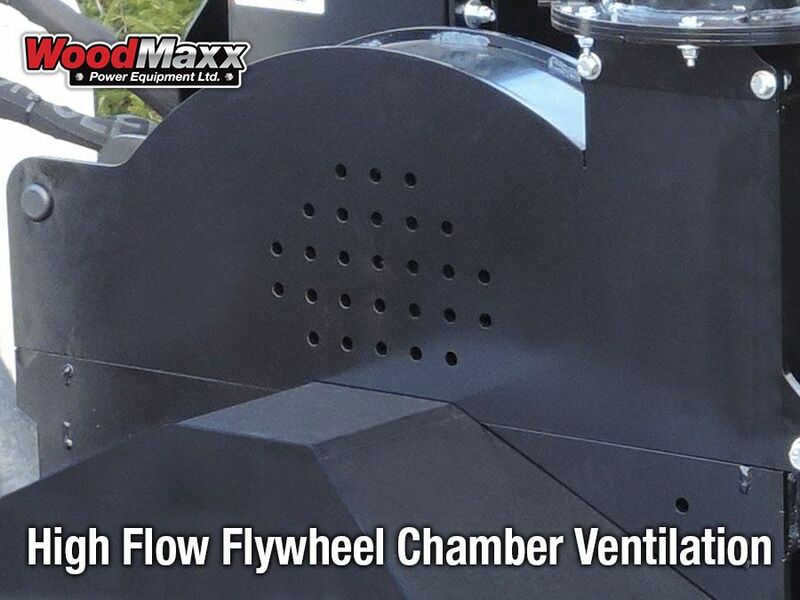 WoodMaxx MX -series wood chippers incorporate a series of precisely located ventilation holes in the flywheel chamber. This feature creates a strong vacuum that draws air into the flywheel chamber, and in combination with the fan blades on the back of the flywheel, forcefully ejects the wood chips out of the chamber. This keeps the discharge chute clear, and reduces the chances of a jam. The WoodMaxx patent pending hole pattern is specifically designed to bring the air into the chamber at the optimal volume and location. Other machines have tried to copy this feature, but have not achieved the same results! 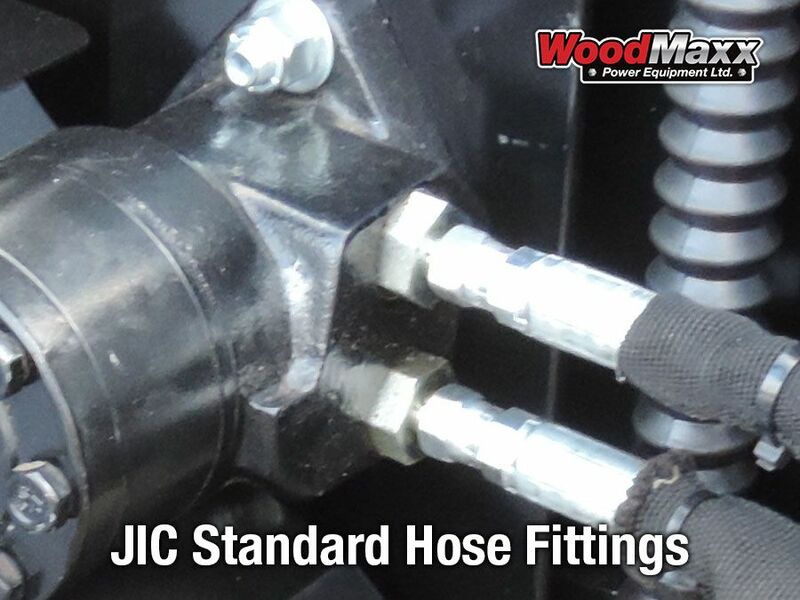 The WoodMaxx MX-9900ss wood chipper utilizes JIC (joint industrial council) hose fittings that are rated for 5000 psi. For you this means that if you ever need to replace a hydraulic hose, your local tractor supply or auto parts store can make hoses while you wait. JIC fittings are widely used in hydraulic fluid transfer, the military, and are typically very easy to come by. No trying to chase down an adapter because of mismatched threads. The 2" main shaft on the MX-9900ss wood chipper passes through the flywheel housing and is supported by two industrial flange bearings. This feature, combined with the 2" shaft, allows the flywheel to run extremely true, while adding a great deal of strength. 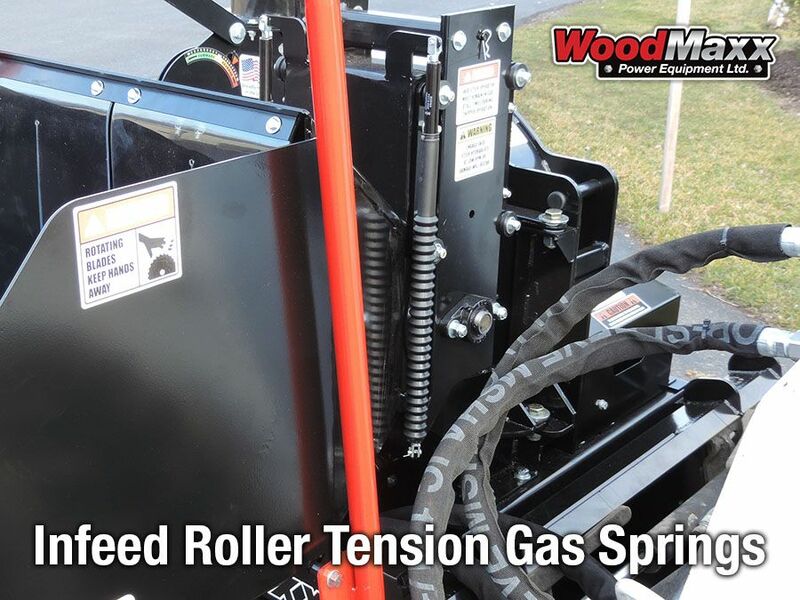 The WoodMaxx MX-series wood chipper utilizes high tension gas springs. These gas springs maintain the same tension throughout the entire range of motion. This feature also slows and dampens the downward motion of the infeed roller to prevent the infeed roller from slamming downward. This ultimately increases the longevity of the components. These high tension gas springs achieve 175 lbs. of downward force that allows the teeth of the infeed roller to dig into the branches and ensure a smooth entry into the chipper head. MX-9900ss... 1303lbs of American made steel. The WoodMaxx MX-9900ss is finished with a powder coating that is baked on at 450 degrees. Powder coating finish is thicker and more durable than ordinary paint. 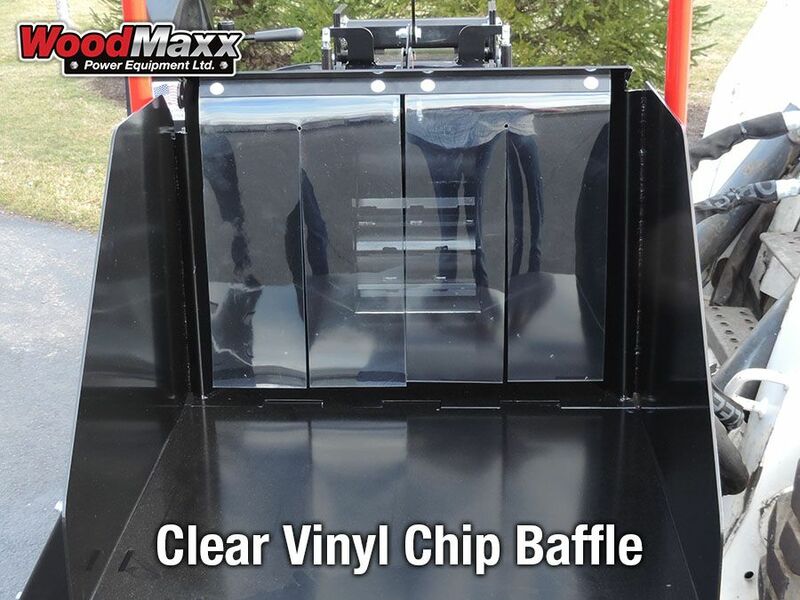 Safety is paramount, therefore the WoodMaxx MX-9900ss is equipped with a clear vinyl baffle feature that protects the user from chip blow-back, while allowing the user to see what is going on in the hopper. The hydraulic hose configuration for the WoodMaxx Mx-9900ss requires only two streamlined hydraulic hoses. This is possible because of the patent pending upgraded hydrostatic drive system that eliminates many of the components and hoses of traditional open hydraulic systems. This feature makes future maintenance a breeze. Along with the simple two hose configuration, the MX-9900ss includes the additional protection of nylon hydraulic hose wrap for long life. 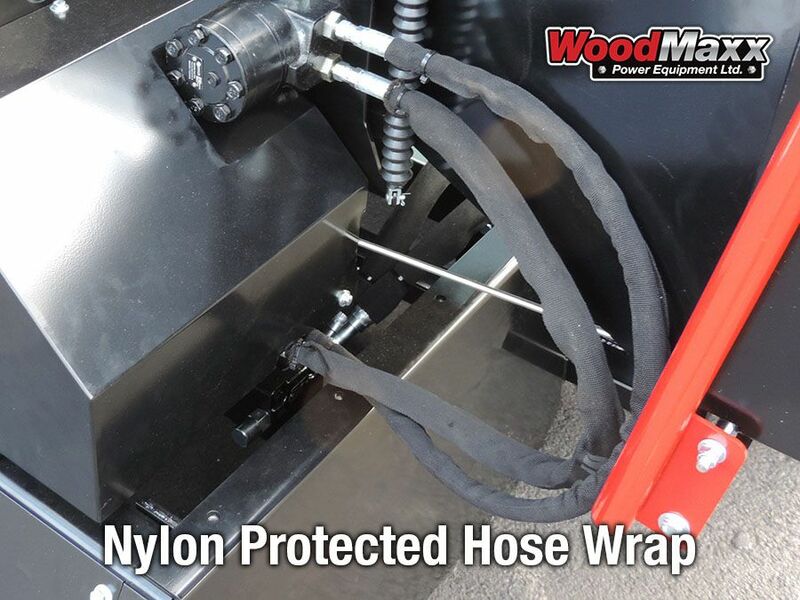 This hose wrap reduces chaffing and protects the hoses from abrasion and environmental damages. WoodMaxx MX-9900ss wood chipper comes with a robust 3 year warranty. Our service department also stocks a full line of replacement parts if the need arises. WoodMaxx is the original chipper of this design. After hundreds of hours spent designing, testing, and research and development to create this wood chipper, WoodMaxx offers the highest level of quality and innovation with many exclusive features not found anywhere else. With the highest quality of workmanship and history of satisfied customers that WoodMaxx has, we are confident that you will be completely satisfied with this machine. Just compare our reviews to those of the competitors, and you can see for yourself! At WoodMaxx our service department is staffed with professional certified technicians that inspect each machine before it is shipped. This ensures that you get a trouble free machine from the get go. When you need technical help or parts, our courteous staff can help you get what you need from our fully stocked warehouse. We keep a full line of replacement parts on hand for your convenience.